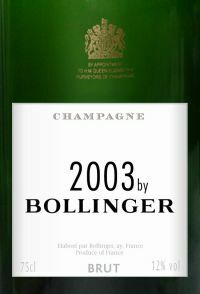 On Thursday 12th April 2007 I tasted a product so new at Bollinger that some family shareholders had not even heard of it, let alone tasted the wine. It’s a new vintage, but it’s not a Grande Année. It’s a one-off special Champagne called 2003 by Bollinger”, and yet it tastes nothing like a Bollinger. It is a soft and sumptuous Champagne, with a gloriously slow-releasing pin-cushion mousse that feels utterly satisfying in the mouth. There is none of the angular oakiness that has, until now, been the consistent hallmark of this most traditional of Champagne houses. And although the wine was barrique-fermented, the oak has been subsumed by the rich, juicy fruit of the 2003 vintage. At the moment, it is the vanilla-finesse of ultra-ripe Chardonnay that dominates the wine from the mid-palate to the finish. Just so not Bollinger!As Ghislain Montgolfier, the président directeur général of Bollinger, explained “The 2003 harvest was not a Grande Année for Bollinger. We knew from the start that the grapes did not have a sufficiently high total acidity, or a low enough pH, to achieve the austere character that is so necessary for a Bollinger Grande Année. As a critic, the packaging is always secondary to the quality of a wine, but I do prefer a good presentation to a poor one, and I have to admit that the packaging of “2003 by Bollinger” is inspired. Most people remember 2003 as the year of the long, oppressively hot, pan-European drought, but in Champagne it started off with temperatures so low that half the region’s potential crop was destroyed. This has been captured on the packaging by a photograph of a snow-laden vineyard. It was the spectacular frosts of the night of 11 April, when temperatures remained at -11°C, followed by three days of freezing fog, during the vulnerable budding period that destroyed most of the potential crop. The vines responded by gradually creating more buds, consequently the flowering was extended from June through to August, with violent hail-storms in June destroying more buds and playing havoc with the flowering.